How’s Your Winter-Sowing Coming Along? I used to kick my African violets out of the fluorescent light gardens to make room for seed-starting indoors. Then I got wise, and started planting those seeds outdoors — most of them during the depths of winter. Not only did this come as a great relief to my African violets, but the winter-sowing procedure produced strong (not spindly) plants that required no “hardening off.” Now in my sixth year of winter-sowing, I wouldn’t dream of starting seeds any other way. 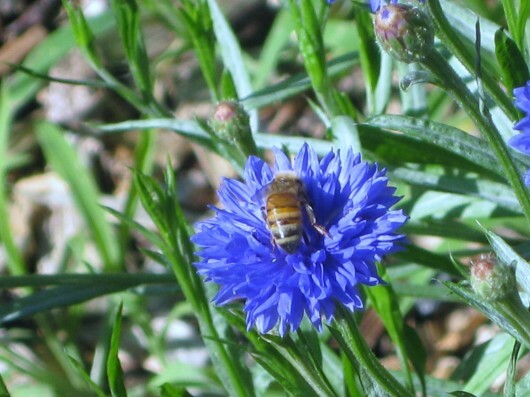 Blue Bachelor Buttons can do much to help the honey bees. I hope you’ll include this Centaurea cyanus in your own winter-sowing schedule. Need proof that winter-sowing really works? Then by all means read Winter-Sowing 101. Have questions about what to winter-sow, and when to plant the seeds? See What to Winter-Sow…& When. And now, back to my original question: How’s your winter-sowing coming along? I hope you’ll drop me a line in the comments section below. Feel free to post questions there, too. I’m all ears. It’s going great thank you! I have 39 containers out there (more than I’ll be able to plant in the spring perhaps). What I’m most excited about right now are three varieties of alpine strawberries! Never tried them before and there’s a lot of hope going into those tiny seeds! I was waiting to sow my annual stuff, but maybe I could go for it? I guess there’s no way to harm a seed by freezing it right? I found your web site last year and decided to try winter-sowing. It was a HUGE success! I haven’t started yet this year, but I’m off tomorrow so the planting will begin. I live in Memphis and the weather here is perfect for winter-sowing (30 degrees one day, 60 degrees the next, not joking!). 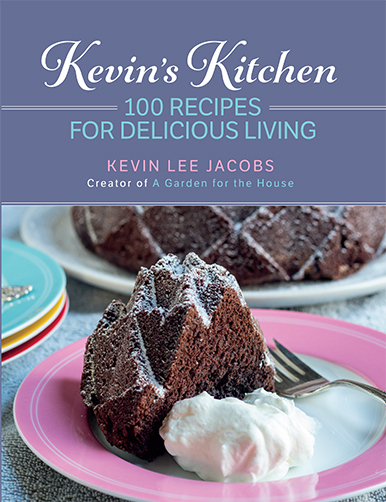 Thank you for all of the wonderful information, great recipes, and beautiful pics. I so enjoy your site. Take care, and have a wonderful winter! Hi Cosette – Wow 39 containers! Kudos to you. I’m with you on Alpine strawberries — they are utterly delicious. As for annuals, here in zone 5-b I sow the hardy-types during the depths of winter. I wait until late March or early April to sow the tender types. If you are in a warmer zone than me, you can start your tender annuals somewhat earlier. Dana – Glad to hear that winter-sowing worked out so well for you last year. Have fun with this year’s project! We bought a home last spring on two acres with no gardens to speak of. Needless to say, my winter sowing of hardy perennials as been in full swing for about a month already. I won’t tell you how many containers I’ve planted so far, but I will say that I think I’ve got a pretty good start to some very nice perennial beds and borders next season. Some plants I’ve sown so far that come to mind: eupatorium maculatum and purpureum, many many aquilegia varieties, wild collected vernonia noveboracensis, wild collected asters, solidago, rudbeckia, and many others. I’m mostly excited about attracting wildlife to our property, so I tend to choose plants that the critters like. Anyway, I love your blog so very much! I’ve spent some time combing through old posts. Thank you so much, and I’m very happy that I happened upon your musings. surfing those seed companies late at night what you’ll end up with !! I am going to WS a few varieties of castor beans. Any idea when I should plant ?? I’m zone 5. I’m so jealous of all of you who have started your planting. We still have over 4′ of snow. Our driveway and the adjacent section of road is still closed (a neighbor and friend husband will try to clear it today). So I can’t get to anyplace to set up an outdoor starting site. But I do have jugs set aside and will start as soon as possible. Thanks, Kevin, for the information. P.S. Next friday is the Birthday of the Trees, time to plant a tree. I’ll miss it too and so will plant my tree asap. Kevin, I want to try this. I am wondering how low your temp get. I have an unheated greenhouse but can not use it yet, as we get down into the – temps, like as low as -30. So I am wondering how the little greenhouses would work with it getting that cold. Hey Kevin – I’m in Wheaton,IL and haven’t had ANY snow. Will winter sowing still work for me. I have seeds 12 containers prepped to go, but am concerned about the lack of precipitation. Gail – Low temperatures are not a problem. (Just think of all the plants in your region that reseed themselves regardless of the cold.) Be sure to read the posts linked above, and then…have fun! Tammy – We had zero snow here during the winter of 2012. I still winter-sowed, and had great germination rates. After planting your containers, soak the soil well (as outlined in Winter-Sowing 101 linked above). Then you can ignore the seeds until they germinate in spring. Hi Kevin, I’m glad I came across this idea of yours. I have started seeds for 4 years under lights in my downstairs level. I am scheduled for surgery early March and didn’t know how I was going to tend those plants downstairs during the month of March. Now I plan to ‘winter sow’ those seeds that I can start in our zone 5 climate and have a neighbor check on them for the first few weeks. All the while she will be learning a new method she might be able to use. I’m a newbie and this is my first winter sowing. I have about a dozen containers filled with my veggies for the garden. All cold-hardy vegetables like tatsoi, mizuna, mache lettuces, swiss chard, turnips etc. I was so happy to continue gardening in January! Thank you for sharing this wonderful way to start our gardens. I am so glad you shared this in your newsletter! My first attempt at winter sowing,,, makes sence to me! I’m 62,, never too late to learn. I have 36 containers planted, and another 12 ready to work with. Helps that my family and friends enjoy milk! I’ve been wondering when I could start vegetable seeds, and in reading comments above, it sounds like I can start now. In Zone 4, I don’t really understand the difference between hearty annuals versus tender varieties. I’ve planted a lot annuals already. This year I enlisted the “help” of our granddaughter and friends to do the actual planting. I had the containers and dirt all ready to go to make it easier to keep their attention. They had a blast! I’m glad they understand it will be a long time for the plants to actually begin showing. They will enjoy taking some home to plant once the time is right. I live in Storm Lake, IA which I believe is zone 5. Can I also do winter see sowing here? Mary Kay – You can absolutely winter-sow in zone 5 Iowa. Just follow the directions linked in the article above, and…have fun! If I don’t have milk jugs to plant in do you have any other ideas what I can plant in. We are not big on milk so we dont have a lot of containers. Kevin, I am trying winter sowing for the first time this winter. I have 6 milk jugs so far. I have lots of seed packs to plant yet. So many seeds so little time. I found this link that has alternative containers for winter sowing. I thought your readers might like to see it. Hi Betty – When you get the chance, be sure to read Winter-Sowing 101. The article explains that any container can be used, as long as light can penetrate its walls. I’ve planted several varieties of heirloom tomatoes. Most have already sprouted; I’m so excited. Kevin, I planted my first 12 milk jugs of veggies last week. I am a new gardner and this method looks like it will be easy and fun. I thought twelve jugs was a lot until I got started. Now I have all my friends and family saving milk jugs so I can plant more things! Thanks for your web site! I have planted 24 milk jugs and have more to go. 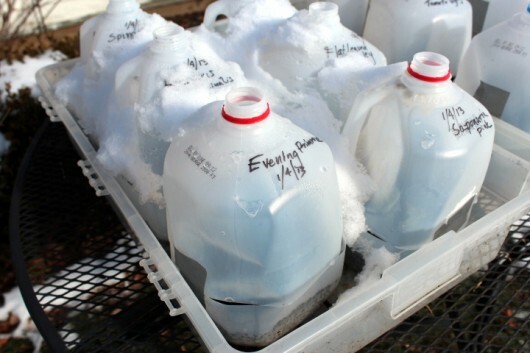 I did a class for my gardening club members earlier this month and everyone went home with at least one gallon ready to put out in the snow. Last year was a great success. I was able to share many plants with my Gardening Club members and at our annual plant sale, we actually made quite a bit of $. I really was amazed at how well WS works. I did not try it on any annuals though. I may try a few this year. I plant a lot of petunias – do you think they will do ok? They seem to come up volunteer very well in the gardens. Are there any annuals that you think would do well? I just stumbled onto your site about a week ago and I love all the coments from everyone and of course all your information and pictures. Oh my goodness…I have been racking my brain trying to figure out how I was going to either A. buy a cold frame or B. Build one. This idea is genius! II actually saved 40 gallon bottles for Halloween decorations ….I am in business….I am new to your site. Thank you! Happy Planting! This is my first year of winter sowing. (thanks to you.) I have 16 jugs. moon flower and lupine Tutti Frutti. I ordered the lupine from Park Seed Co. when I recieved the seeds. on the packets it said that the seeds origin was ENGLAND. wish me luck. I live in Indianapolis IN. zone 5. I put them on the ground along a sunny fence row then ran a twine thru the handles and tied them to the fence. thanks for your site. I really enjoy it. and if I ever come to walk your beautiful gardens I wont wear 4″ heels. If you need milk jugs try stopping by your local independent coffee stand one morning and ask them if they’d be willing to save the milk jugs for you. They go through dozens of gallons every day. I just started yesterday with spinach, mustard, swiss chard, and parsley as I had leftover seed. I still need to order my seeds for this year. In a couple of weeks we are starting a winter sowing project for our community school garden. After we received a grant a few yrs. ago to install the garden, we had leftover funds for only a few grow lights. This brilliant idea works perfectly for the classrooms that don’t have lights w/o us needing to find $$ in the school budget (which trust me, is not going to happen). And personally, I think it offers a better lesson for the kids to watch the seeds emerge after being exposed to the elements of WI winter. Greetings from zone 6b…have had a suburban container garden for several years with a fairly decent success rate. Work at a career and tech high school with an unbelievable greenhouse so students usually start seeds for me. This year I’m giving WS a try. This morning I created my first 3 milk jugs: oregano, lettuce (Burpee’s Salad Bowl), and spinach. Calling for light snow today…anxious to see how this goes. Thanks for great information. Marie – Congratulations on your 2012 winter-sowing success! May 2013 be so kind. Yes, you can winter-sow petunias. Jean – The potting mix you purchased is fine for winter-sowing purposes. From your list, the Bachelor Buttons,Stock, Cilantro, Kale, Peas,Swiss Chard, Spinach and Butterfly weed can all be started outdoors in January. I always direct-sow soybeans, zucchini, etc. in late spring. As for onion seeds, start them indoors (preferably under lights) in February. Theresa in zone 7a – You can start right now! Mike – I’ve had fantastic success winter-sowing Russell Hybrid lupins. I suspect your England-born variety will do as well, although they might demand tea and scones each afternoon. Erica – Great tip for obtaining gallon-size milk jugs. Another source is the local recycling station. badger gardener – What a great project to do with kids! I took the plunge and started 4 jugs this weekend. When I stopped at the local home store, I found a big rack of seeds 20 packets for $1 and that got me thinking and the next thing I know I’m picking out seed packets. So I planted some hardier plants like a little tiny dianthus and some blue bachelor buttons (what a coincidence!) I also tried some tomato seeds as an experiment. I thought they might be too early, but I see you started some this weekend as wel and since we are in the same hardiness zone, I feel a little more comfortable about it. I tried to make compartments in the jugs with some improvised cardboard dividers I cut out of a cereal box. I think it will work pretty well. Guess we’ll see. I love that the 2013 gardening season has started already! We are also in zone 5, but in a severe drought and it continues. I feel the need to water in my jugs, as since 2 weeks ago when I planted them with broccoli, we have had ONE time of any precipitation, 2 inches of snow. They are supposed to germinate in 7-14 days and there’s nothing there. I have begun watering the jugs now. Think that’s a good idea? Could it be too late or will they take off when they get moist? Also, thank you SO much for this beautiful project and explanation. My friends and I donate seeds and starts for a community garden in a poor urban area. This will make it cheaper, easier and earlier. Thank you! I’m trying this out and only have 3 milk jugs but I have a ton of water bottles (about 20 oz) sitting around and have considered using them to plant a couple seeds each. They are certainly deep enough but I’m hesitating as to whether they are large enough otherwise. I’m in an apartment at the moment so my outdoors space to be setting containers is quite limited. Hi Carrie – In 2012, my region (New York’s Hudson Valley — zone 5-b) endured a drought. I did not water the jugs during that time. Mercifully the rains arrived in March, and all turned out well for the winter-sown seeds. You can ignore the “days to germination” info on the seed packets. The seeds will sprout just as nature intends them to — in spring. Thanks so much for the helpful information, so excited to be planting the winter-sowing way this year. You never touched on vermiculite in the raised beds. Just wondered what your opinion was of it or if you ever used it? I understand it is a by product of lava from the eruption of a volcano so it would be natural. I have used the coarse before and it seems to work well, but was concerned since I am trying to do organic if there is a reason I shouldn’t use it. Thanks again for your wonderful blog, just love all of the good ideas and the tour of the property were so pretty. Lilly reminds me of my sweet Anni Lou who just loves to get out in the snow and bury her nose and face. She is a pekingnese and just loves snow. Kevin: I have been nervous about actually sowing anything this early in my zone 6, but since I had 5 milk containers sitting around and your posts are so inspiring, decided to go for it. I just set out Bachelor Buttons, spinach, sweet peas, lettuce and parsley. Keep you fingers crossed!! Thank you for the wonderful ideas! Hi Jean – No problem adding vermiculite to raised beds. And besides raised beds, you might like to add it, as I once did, to window box and other summertime planters. The material holds a good deal of moisture in the soil. Jean Thomas – Kudos to you! I was all set to participate in the winter sewing, but we are zone 5, fomerly zone 4 and the weather has been unstable. 2 winter storms, then January thaw for 2weeks running around in shorts, then 1 week of dry cold weather freezing. No snow, then Spring again and now a bit of snow, polar winds and 9 degrees. My soil is frozen and I think i will wait until midfle of February before I start. 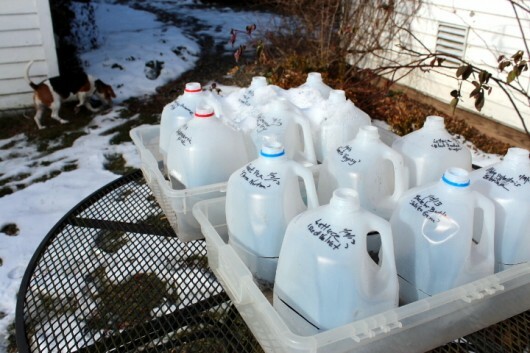 I did collect milk jugs, but I am just afraid it is too cold without snowcover. Renate – Sounds like we are having the same winter. Here, in New York’s Hudson Valley, temperatures were in the upper 40s over the weekend. But today’s high was 17 degrees. And it’s supposed to be even colder tomorrow! But I’m not worried about the perennial and hardy annual seeds I’ve already winter-sowed. Why? Because in nature, these seeds endure such brutal winters, along with freeze-and-thaw cycles. And when spring arrives, they…sprout. Hi Kevin! I only had 8 milk jugs to start with, but I plan to sow more as I get more jugs. Right now my jugs are sitting on the soil in an enclosed area so my dogs can’t get to them and so they can get sunshine, rain and snow. I’m wondering, however, if I should have them in a plastic tub or something of that sort. Does it make a difference as long as I don’t let them dry out? Also, I’ve been trying to find a list of vegetables and plants and their ideal sowing times for zone 8, which is where I am. Do you know of such a list? It was so exciting getting the seeds started and I can’t wait to see how they do! Hi Ann Marie – No need to keep your “greenhouses” in a tub or box. Your containers are exposed to the elements, just as they should be. I keep mine corralled in 4-inch-deep sterlite boxes, simply to make them easy to move (should I have to move them). I’m not aware of a specific list for winter-sowing in zone 8. My own policy is to plant perennials and frost-tolerant annuals during the depths of winter. I sow frost-tender annuals closer to spring. Winter-sowing is definitely not an exact science! Thanks for answering so quickly! I guess it’s just going to be a learning experience. I don’t mind. Looking forward to it! Did you have trouble with varmints getting in and eating your seeds? Hi Nicole H – Yes, you could use your domed seed-starting kits for winter-sowing. Just keep in mind that each cell holds only a tiny amount of soil. And that soil will dry out very quickly. 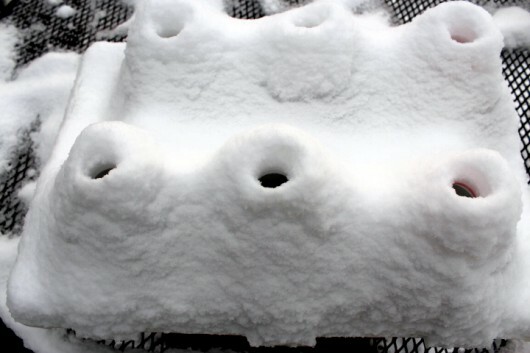 Consequently, be prepared to monitor the cells for moisture after sprouting occurs.You’ll also need to make a half-inch (or larger) opening in the lid above each cell so that rain/snow/sleet can reach the seeds. Debe Hudson – That’s one of the great advantages of winter-sowing — squirrels, chipmunks and birds can’t get into the containers. And if you keep the containers in a plastic bin (this must have drainage holes), as I do, critters won’t be able to tip the containers over. I set my containers on a patio table, out of the reach of Lily the Beagle. I’ve got to make a effort this week to unbury them and get some flowers started outside… ASAP! though my basement is fairly chilly and I’ve started some easy seeds down there… can I call them my ‘winter-sown’ containers? Hehehe… There’s primarily grasses, herbs, lettuce… I’m trying to get some early greens in the ground incase we get a warm spell like last year! I also still need to place my 2013 seed order… so much to do! Well, I’m getting started this year and I highly enjoy it ! I read about ws on tipnut and I was interested ; I started collecting all sorts of containers, jugs, clear plastic bags… and I did two rounds to start with. Some seeds are quite old because I had had very little success with indoors sowing or direct sowing, but I think that even if they don’t succeed I’ll give it a shot and 3 to 1 years after expiring date is not too much, some might give some results. I asked my neighbours to save their big water bottles, and until my next sowing session on Feb.13th, I will have plenty ! It is a nice way to start the gardening year, even in winter where there is supposedly nothing to do. Now there is, little by little. I saw a picture recently of your beautiful fern. It looked so green and healthy. How do you winter them over? I ,for the first time today, made my milk jug greenhouse. I am excited about what the future holds in it. I look forward to your wisdom in my e-mail. It’s like talking to my garden savy neighbor. Thanks for a great website, just love it when you blog. I am trying out winter sowing this year! Last year I sowed hollyhocks and a few delphiniums in a milk jug outside around March 25th (before having read about winter sowing). We had the mild winter conditions though here in north central Pennsylvania (zone 5 or zone 6). This year I am sowing much earlier since I am learning I can! I am trying sowing some different varieties of primroses (I hope they make it) and also some Lupines Morello Cherry (I didn’t know if I should nick the seeds with the nail clippers and still soak them since I am sowing them earlier in the winter). Also It says on the packet that they germinate when temperatures are 65 degrees. We’ll see? I like delphiniums and I am sowing some of those too and some different kind of foxgloves and coneflower seeds. I am excited to eventually start some strawberry plants form seed too. My husband thinks this new hobby of mine is strange but I see it as a science experiment and neat way to save a little money by not buying so many expensive root bound plants from the nurseries this year. I have 12 jugs started. As for getting enough jugs I went to the grocery store and bought water jugs. We drank the water and then recycled the jugs. This is my first year doing the winter sowing and am exicted to see my results. I can’t wait. Thanks, Kevin for all you information on this site I have learned so much. Have winter sowed hollyhocks, forget me nots, primula, columbine, Canterbury bells, poppies and lupine thus far. More to come in the next few weeks. This is the first time I have winter sowed so am looking forward to seeing the results. Kevin… Do you remember hearing from me back in October asking about Narcissus ‘Erlicheer’? I work at a greenhouse, and my bulb suppliers had substituted a few boxes in error. According to them, they could be treated like regular paperwhites and grown with no cold treatment. Well… I tried that and had mixed results. They did grow… but a large percentage of the bulbs never produced a flower spike… just foliage. About a half dozen bulbs in my trial did send up a flower spike and actually produced blooms. They were beautiful…. Lovely little pale yellow pom poms with a knockout fragrance. I would definitely force them again… but next time I would give them the standard cold treatment like other bulbs. Thought you’d like to know the results. Robin – I divide my ferns each autumn. The youngsters are really easy to maintain in winter, and they don’t develop brown, unsightly fronds. My growing guide for Davallia fejeensis (Rabbit’s foot fern) is here; guide for Boston fern is here. Scott Trudell – Great to know the results of your ‘Erlicheer’ experiment. I’ve always given this narcissus 8-10 weeks of cold and dark after potting in October. And yes — the scent is something to sing about! I have 27 jugs out so far and 8 more to go. That is, until March of course when I have the urge to sow annuals! Haven’t even begun! Fell and broke three ribs so there’s no way I can get the soil into the jugs and then lug the jugs out to sit in a raised planter. There is a major rethinking on what to plant and when. Drat. Grape vines should also be pruned by now as well. Hi Rebekka – Where you live, the temperature is fine for winter-sowing perennials and frost-hardy annuals. Sow frost-tender annuals 8 weeks or so before your last predicted spring frost. As for containers, feel free to improvise. The containers should be deep enough to hold 2 inches of soil. I sow tiny, dust-like seeds as thinly as possible. I plant larger seeds approximately 2 inches apart from each other. Hope this was helpful to you! Tara – Kudos to you! Susan in MI – Oh, my. Several years ago I broke just one rib. I can’t imagine the pain of breaking three! Take it easy, and please try to get some help with your projects (like pruning the grape vines), okay? I’m jealous of your evening primrose! I already have more seeds and plants than I know what to do with but I have always loved it. What a cool idea. I have never done winter sowing before but I would love to plant herbs and tomatoes. Kevin, I really enjoy your newsletter. Thanks for sharing. I’m in Hudson valley, NY zone 5 and milk jug “first timer” I planted 8 milk jugs w/ spinach, morning glories, foxgloves, peppers, cauliflower, tomatoes; 2-liter bottle of basil, (2) water bottles with cilantro and oregano. Hi Ann Marie – Wow – peas this early! In which region do you live? . Mike groty sent me your way, so here’s some love! Can I do impatience in the jugs . I want to make hanging plants for mothers day, When should I start the seeds? Hi Margie, and welcome. More info please — in which region do you live? Here in New York’s Hudson Valley (zone 5-b), impatiens reseed themselves. This means they are good candidates for winter-sowing in January/February (although they can also be started in March or April). I live close to Dallas, TX so I’m in Zone 8. I guess I should wait and start peas in Feb? Fortunately I still have some pea seeds so if the sprouts don’t survive I’ll start some more next month. Ann Marie – I just checked the weather forecast for Dallas. You seem to be having perfect pea weather, or PPW. As a matter of fact, you can probably transplant the seedlings into your garden now. A touch of frost will not harm peas. Awesome! I should have them planted this week. I’ll be putting up a trellis soon after. How exciting! Hi Kevin, I read your tutorial on wintersowing last winter, but was a bit too busy (building a house, trying to plant a couple hundred little trees, etc) to do it. However, I saved gallon milk jugs all year (my husband thinks I’m kind of crazy) and am ready to go! One question, as a near-newbie to gardening- how many seeds do I plant per container? I know it’s likely different depending on seed size, but should it be the distance the seed packets say to plant them? Hope it’s not a silly question! Thank you from someone just to the north of you, in Washington County! Sylvia – Sounds like you are good to go! As for seed spacing…I sow tiny, dust-like seeds (Nicotiana, for instance) as thinly as possible, and larger seeds (i.e., lupins) approximately 2 inches apart from each other. Sowed leaf-lettuce seeds in two, gallon milk jugs today. I’m hoping I can grow them to maturity in the jugs becasue I can only do container gardening in my limited-space Townhouse area. My other option is transfer the seedlings to 5″ deep window boxes that I can put on a balcony railing. What do you think? Hi John – When they are big enough to handle, I’d transplant the lettuce seedlings to your window boxes. They will be far happier the boxes’ 5 inches of soil than the milk jugs’ 2 inches of soil. Have fun – and kudos to you for starting your winter-sowing project. 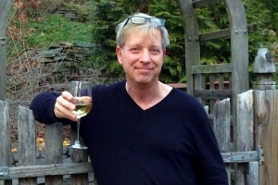 Hi Kevin: I just learned about winter sowing in early January. I have planted 20 milk jugs which are now covered in snow in my back yard. The information I gleaned from the internet said that seeds are genetically programmed to sprout at the proper time. As an experiment I planted a couple of varieties of tomato, zucchini, winter squash, lettuce, spinach, broccoli, cauliflower, Brussels sprouts, some perennial flowers and some annual flowers. I live in zone 3 in British Columbia, Canada. I’ll let you know how these do in the spring. Thanks for an informative site! I love your newsletter and love your “forced” blooming plants in the heart of WINTER! AMAZING!!!! I really wish you would just use the English names for flowers. I am a newbie gardener and don’t know any of the Latin Names. It’s just so annoying and I know the English names much easier! I plan on starting my winter sowing this weekend or next. I am a terrible PROCRASTINATOR….. I saved many containers for this purpose and I just have to start!!! I have apple seeds sprouting in my refrigerator right now. They have been in there for 3 MONTHS! I just want to plant apple seeds to see what will happen!!!! Love your newsletter! I just started. Most of mine are herbs and leafy veggies. No flowers, yet. I’m trying to focus on edibles this year. Going to use some of my space for “pretty” things and try growing something to eat. I did some of this last year and it worked so I’m psyched about doing it on a larger scale. Have been following your advice on the garden cover and recipes and seed sowing out of doors and all of your wonderful tips. Thanks so much for all you do! Kevin, when would you start your petunias, and when is your last frost date? I have been going on the “don’t plant until after the full moon in May” adage, and I’m in zone 5b. Also, can I winter-sow cleome? BTW, I’m losing my beauty sleep over your wonderful blog. Once supper is done and a favorite TV show or two, I’ve been settling down with your site and reading for hours. So, Kevin, for a seed like viola and pansy that need darkness to germinate, do we just cover with extra soil? Hi Susi – Sorry for keeping you up at night! Even here in cold zone 5-b, petunias and cleome reseed themselves. Consequently you can winter-sow them anytime (like today, when the temperature is below freezing). You are right about viola and pansy — just cover them with a little soil, and then lightly firm the soil down. That is all the darkness they’d receive in nature. Hi Kevin, I’m in USDA zone 8B (extremely mild climate on the central CA coast, always moderated by the nearby Pacific) so though it rarely freezes here, neither does it ever get very hot. Though over the years I’ve tried many seed-starting methods, including using recycled plastic milk jugs, I am now trying leaving the top portion attached with a “hinge” to create a mini-greenhouse. Am excited about the need to water only seldom plus very enthused about how this method will protect the tiny seedlings from our every-ravenous snails & slugs. May I write about your method in my weekly garden column for the Santa Cruz Sentinel, giving a link to your blog, of course? Many thanks. Hi Sharon – Yes, with credit and link you can certainly share my tips with your readers. Hope you’ll send me the article! I’ve a question about cold treating seeds? I’d like to start an heirloom variety of strawberries and the directions call for cold treating the seeds for 2 to 4 weeks in the freezer. Will this step be unnecessary if I winter sow them? Thanks for all the work you put into this blog! It’s made my gardening on a strict budget possible. We have 4 kids, 3 dogs and very little room so taking the mess outside is wonderful. I’m going to give starting asparagus a go too, any suggestions? Bare root is probably easier, but seeds are so much less. Woo hoo- Storm Charlotte is in full swig here in CT, and she is going to be HUGE!! But my excitement stems from just now putting out 4 jugs of seeds– not a lot but it’s a start until I get my seeds from Swallowtail. I sowed European aquiligea and perennial alyssum. ( Basket of Gold). I keep going out and looking over the deck to see them nestled down in a corner of the garden next to the stone wall. They are weighted with several bricks, as Charlotte is allegedly bringing some 60 mph winds with her tonight. Thanks for getting me excited about growing from seeds again, Kevin. I was finished with seed starting after too many years of disappointing results under lights in the basement, but the excitement is back! So glad I stumbled on your blog! I’m in zone 6b and have started seeds indoors form many years and I’m trying this winter sowing for the first time. Our master gardener program just posted an article on Facebook about this method and I found your step by instructions to be very clear. I planted lettuce, parsley, and kale this week. I also am trying my onions both indoors and out to compare how they do. Help Kevin I live in MO and zone 5. But it’s been in the 50s. One of my little milk carton greenhouses are sprouting. Will the weather change kill them???? Kevin, I’ve been gardening for about 5 years now, slowly building up my beds and planting the major structural trees, shrubs & such. This year I am so excited to be able to start filling in some of the spaces w/ perrineals and annuals gown in these little “greenhouses”. I found your website last summer, and couldn’t wait to start the greenhouses this winter. So far I have echinacea, morning glories, and foxgloves for the flowers. I’m waiting on some annual seeds I ordered that should be here anytime. I saved some seeds from an heirloom tomatoe plant given to me last year; “Mortgage Lifter”. They were huge, meaty, and delicious. I planted 6 cartons of them, and am anxious to see if they grow! Anyway, I just wanted to say “Thank You” for you website, and for all the information you share about gardening. I’m learning alot! This is my second year winter sowing. I’m still a skeerdy cat though and usually just resort to perennials or annuals that I know self sow lol. Maybe I’ll be brave enough to try some petunias and impatiens ! I had no idea you could winter sow lettuce and spinach, hurray! Definately going to try those. What about Basil? I have 4 different varieties and really want to plant a lot this year because I use so much in cooking that I never have enough left to freeze big batches of pesto. Last year I planted Borage for the bees , oh my goodness such gorgeous blue flowers, well worth having in the veggie garden for some pretty colors. Most likely would do great in the flower gardens as well, but I encourage them for the pollination of my veggies. It turned into such a big beautiful plant, everyone asked me what it was. 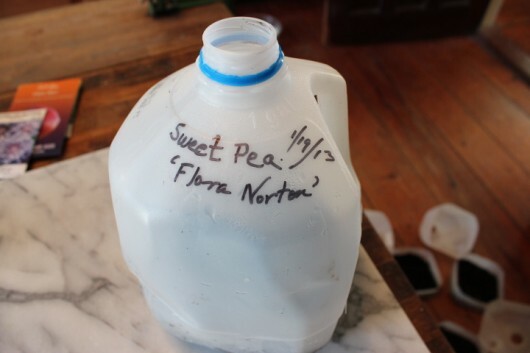 You can wintersow sweet peas? Last year was my first time growing them (I only had them in containers) and had germination problems. The Window Box mix from Renees did well, but the others did not. Maybe I’ll give those a go. Hello Kevin! This is my first time hearing of this method and my first time planting any kind of anything outside. I’m certainly excited to get started! I saw that all your jugs are in plastic containers. Is this just to keep them upright or does keeping them off the ground help with temperature? I don’t have any large plastic boxes. Can I just line the jugs up on the concrete of the back porch out from under the awning where they will get sun and precipitation? I had other questions but your thorough explanation and pictures have answered them. Thanks so much! I checked my mini greenhouses today not expecting to see anything sprouting yet, but was pleasantly surprised to see some of my Bachelor Buttons popping up already! This is my first year trying this method and I also have some trays indoors (what a huge pain!) and think if this works out, I may never use my trays again. Thank you for the great blog on this subject! Didn’t see your winter sowing project until late Feb. so just started in early March. I’m excited to see how it comes out. My husband thinks I’m crazy because I keep yelling at him not to crush the milk containers (he does that before putting them out to recycle so more room in our recycle container). On the night before garbage pick up, I went out & got some more milk jugs from our neighbors trash as I bought too many seeds. I have 8 and counting. Also, tip for making them, if you do not have a gas stove or torch, you can heat your screwdriver with a large candle. HI, we winter sowed spinach, lettuce, sweet peas, lima beans and some other. In the Chicagoland area, temps have been well below normal but the lima beans and sweet peas with the larger seeds you can definitly see something going on, my son who is 4 helped me and is very excited for this project. Thank you so much for this idea. We have some tomato seed that we will sow next month. Are you planting by the moon phases? Mar. 17 is also the day to plant potatoes. I have Blue Scotch Curled Kale, Ziar Poppy & German Chamomile making appearances! I’m so excited as this is my 1st of winter-sowing! Have been telling all my gardening friends & directing them to your web-site! So, my big question is… when are you going to write a book on the subject of winter-sowing? Enjoy referencing your website but would love having something pertaining to this method on my bookshelves. Love your work Kevin, keep it up! I planted 8 milk gallons on feb 26th: Snow Peas, Broccoli, Onions, Arugula, Spinach, Head Lettuce, Cauliflower and Cat grass. On March 17 I planted: Boston Lettuce, Beets, Radishes, Leaf Lettuce, Carrots, Spinach, Baby Leaf Lettuce, and COS Lettuce. I didn’t find this site until late Feb. Last year over a thre month period of starting plants under lights I spent about $60.00 more in electricity over that period than I usually do. I hope to save the money spent on the additional electricity. Do you have photos or instructions for getting all these winter-sown plant babies into the ground once real spring gets here? I’m particularly interested in what to do if the plants in the jugs outgrow the space before time to get them into the ground. Or is this never a problem? Thanks for a great idea and a blog. Kevin, This is my first attemt at winter sowing. I live in zone 6 and planted dahlia’s the last week of January. I do not see any sign of germination as yet. Should I be seeing some growth by now? Hi Terry – It’s a bit early for dahlias in zone 6. The only plants sprouting for me just now are spinach and hyssop — two early birds. My root crops are about an inch high now. Will be planting kale, lettuce and broccoli Wednesday. Thanks for the great tip. I have cool season veggies growing and some already in the garden. Some of my perennials are also up. My last freeze date is mid April so if a freeze is headed this way the stuff in the ground will be protected with a row cover. I checked my milk jugs today and imagine my surprise that the head lettuce was coming up. So far that is the only one sprouting. It would be nice if I was able to plant in the garden now, but there is still some snow on the ground. We are getting more snow today, 5-7″, do you think my seeds are still going to grow? Can I still plant others? We are zone 4. I am going to try my hand at straw bale gardening. That will give me a little headstart also! Hi Pat – More snow? Yikes! But your perennial seedlings should be fine. I’d wait until the snow melts to plant your front-tender annuals (zinnias, heat-loving veggies, etc.). This is a record of somethings that have sprouted for me in the past 3-4 weeks. 1st thing: Hollyhock seeds (within the first warm week after Easter beginning of April. 2nd: Coneflowers have sprouted in the past 2-2 and 1/2 weeks. 3rd (FINLLY a few white bee delphinium seeds. I am still waiting on all the rest of my delphinium seeds. Broccoli (of course), sugar snap pea, some sweet williams and a few crazy daisies. I think a primrose (did begin once in a bright window at the beginning of march. Husker Red penstemom (there might be just 1 tiny seed and that is all). I am looking forward to growing these and really hope they do sprout. I have a spray bottle I bought at a dollar general store and I have still walked around and moistened the soil in the milk jugs if the wing was blowing a lot and the air has been dry. I didn’t want to risk my “mini greenhouses” from drying out. Hope many others are having fun watching their seed’s sprout and grow!! I wonder if I can winter sow Mary Washington asparagus seeds (just bought a pack of the seeds from a walmart)! Ooops I was making a ton of typos!! I better go to bed because this is past my bedtime… happy spring! Love your site and enjoy all of your postings. I live in Atlanta GA area and wonder if the winter-sowing would be effective in this Southern climate? If so, when would be the right time to begin? We may experience a light frost, rarely a small amount of snow. Have access to a community garden nearby and would like to get a strong start in 2014. Thank you for your reply. I used Winter Sowing for the first time last winter, my first here in PA. What an experience. The neighbors thought I had lost my mind when I told them I had seeds in those jugs in the front yard in late January. I was brand new to the area and got the idea from a Penn State workshop here in town. As funny as that was, it was even funnier when they saw me pull all of those seedlings ready to plant for free and they had to go to the local Lowes and pay for theirs. Hi Erin – Your miniature greenhouses look terrific. You can never have too many drainage holes in the bottom of a jug. The ventilation holes you made at the top will pay off when the weather starts to warm. What’s up in my little gallon jug greenhouses? Shasta Daisies, Candy Tuft, Brussels Sprouts, Kale, Hollyhocks, and Marigolds! These were all planted in January. What a treat to go outside today to add my March plantings to the other greenhouses and find out I actually have things growing! Thanks for this post. I am so happy not to have half my living room full of seedlings under lights this year! Question: Can I winter sow Holly Hocks? What about the generic ‘wildflower’ seed packets? Hi Kristin – Hollyhocks and wildflower seeds are both excellent candidates for winter-sowing. Have fun! a little bit of moisture, the possibility of mold infestation is high. to you as opposed to you actively searching for the pike. It is the rare person that would describe the pike as anything but ugly. Kevin, I am a Master Gardener living in Mobile AL. This year I decided to not start seedlings indoors under lights. The most difficult part of it is always the hardening off stage. Besides shutting off a room to keep my curious cats from creating a plant and soil disaster. I have dabbled in winter sowing for the last few years but this year I went whole hog. My greatest successes were with the milk jugs. Two liters seemed to dry out too fast. I’m now planting and sharing lots of the most healthy winter plants I have ever grown. I really appreciate your tips on winter sowing, and have given some presentations on the subject. Thanks for sharing it on your site. to ensure that there are no medical ailments occurring due to the exposure to molds, be it infrequent or continuous. remediation expert, home and business owners can benefit from many advantages not afforded otherwise. living and trout fishing in the Mountain West – the heart of trophy trout country. such as overstock and close out items as well as thrift store finds. do not have much experience with car engines. I find that using a Sharpe to mark the jugs when winter sowing seems to wash off or fade before planting season making it more difficult to know which plants are in which jug. Any suggestions or a more permanent making solution? If I winter sow petunias can I use petunia pelleted seeds and if so should I soak the seed first? Thank you for your help and wisdom! I have used this method for years. My neighbors thought I lost my mind, the first year I put out the milk jugs. It works here in NW Montana, it will work just about anywhere.